I AM A CRAZY CAT LADY! At least that’s what some people think of me, I can see it on their face! OMG! She’s a weird one, a CRAZY CAT LADY. Now I did a little surfing on just how much money we PET owners spend annually on TOYS for our PETS, CATS = $21 and DOGS = $43. And those numbers kinda prove what I really wanna talk about…. The difference between and CAT owners and DOG owners and the way those people are perceived by others. I think, CAT owners spend half as much on toys because they don't want society to think they are a CRAZY CAT LADY! I’m a CAT owner. Two of them currently live with me. 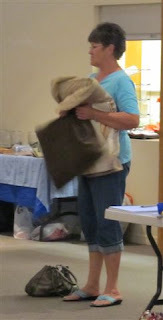 I have been the owner (or caregiver if my kids were the OWNER) of many different PETS. CATS, DOGS, fishes, hamsters, guinea pigs and birds (that’s the list as best I can remember). However, in my lifetime I cannot remember a time when I was not living with a CAT. When a person enters my home I can tell pretty quick if they don’t like CATS by the way they react to my CATS. 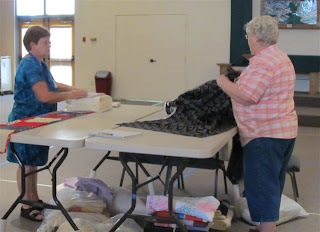 Last week a quilty friend came over to raid my fabric stash. When I opened the closet that contains shelves of fabric the gal gasp, “There’s a CAT up there!” Which there was… My sweet little Rosy was on the top shelf taking her nap on a box. I got the impression the gal did NOT like CATS cuz she didn’t make any other comments (like how cute she was or what a perfect napping spot). Then there’s the gal (a DOG owner) that shared with me her surprise that there are a LOT of CAT toys in my house (I’ve been to her house, seen the dog toys AND petted her dog). Some people totally ignore my CATS and others acknowledge their presence with talk or pet. Anyway. It seems like a LOT of people (even CAT owners) think CATS are just a fixture or treat them as an on demand pet but DOGS aren’t often treated that way. It is acceptable to most people for a DOG to greet company at the door and act as though it should be acknowledged (spoken to or petted). Dogs’ toys are often strewn throughout the house and yard. It’s acceptable for a DOG owner to play with their dog when company is present (or the DOG expects visitors to play with it). Owners take their DOGS on outings to parks and get togethers. Dogs usually have their own beds or they sleep on the couch or in a favorite chair. DOG stories are shared and compared… like that of our children and grandchildren. But, as a CAT owner… I get labeled a CRAZY CAT LADY when people see my cats have lots of toys (like a dog) and I actually play with them (like a dog). I’m always talking to my CATS (like a dog). AND they often answer me (like a dog)! They greet me at the door when I come home (like a dog). 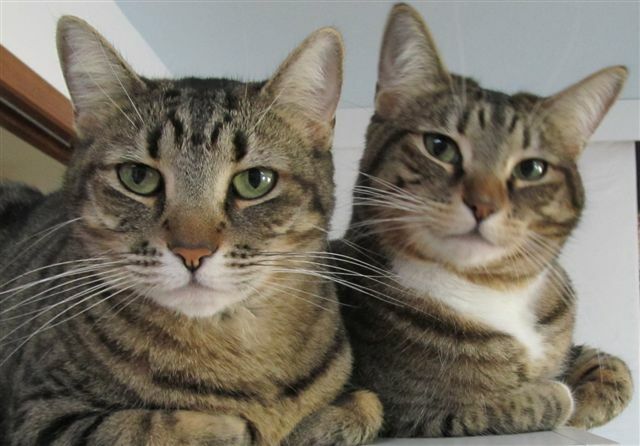 They will beg for treats (like a dog) and let me know when they are ready for breakfast and dinner (like a dog). They get excited when I bring a new toy home for them (like a dog). They follow me all over the house (like a dog). They run to the door when someone comes to visit (like a dog). AND I share stories about them with other people (like a DOG OWNER). So anyway… I guess my point is… please don’t label me as a CRAZY CAT LADY. I’m not weird just because I find pleasure is living with a couple of CATS and try my darnest to make their life living with me pleasurable. Like a DOG owner. Finished size: 98" x 98"
This quilt top was completed in 2006… THAT WAS 6 YEARS AGO ! Geez, that’s a long time. Anyway… It’s done now. So this one started as a Block of the Month with my AQG quilt group www.azquiltersguild.com, the Cactus Patchers (I’ve mentioned them before) www.cactuspatchers.com. 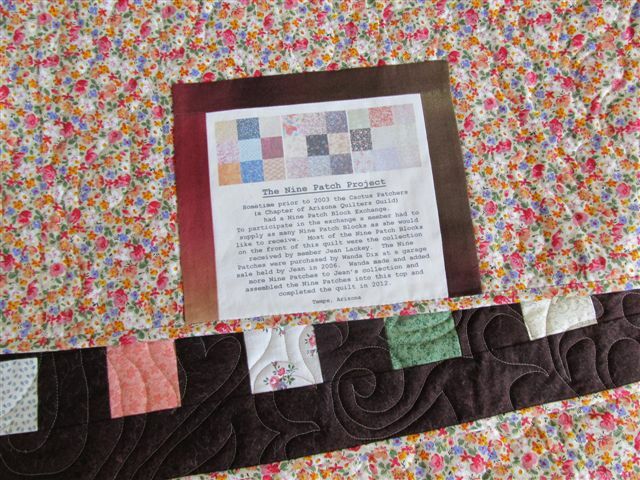 Quilt back with label sewn in. Fast forward to 2012 and the time had come to GET IT DONE. That meant getting a back and a label together. I shared that adventure with you in a the blog post on July 10 titled “I Seam To Be On A Roll!”. Since there were fabrics left over from the top construction I was able to put a couple of pillow shams together. Nothing fancy here! 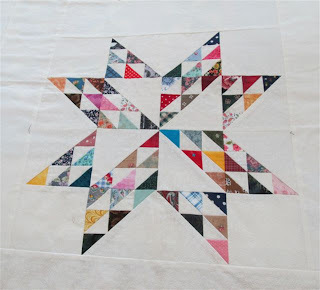 I know myself well enough to know if I planned to make something really cool (like a small Feathered Star in the center of each sham) I would REALLY just be creating ANOTHER UFO instead of pillow shams. 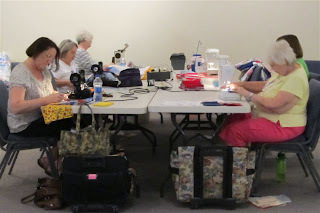 A few days ago a friend, Cathy Witske, had a few of us quilty gals over for a Bed Turning. 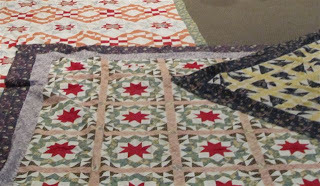 Cathy has been making quilts for a long time and has a pretty impressive pile of quilts to show for her years of work. 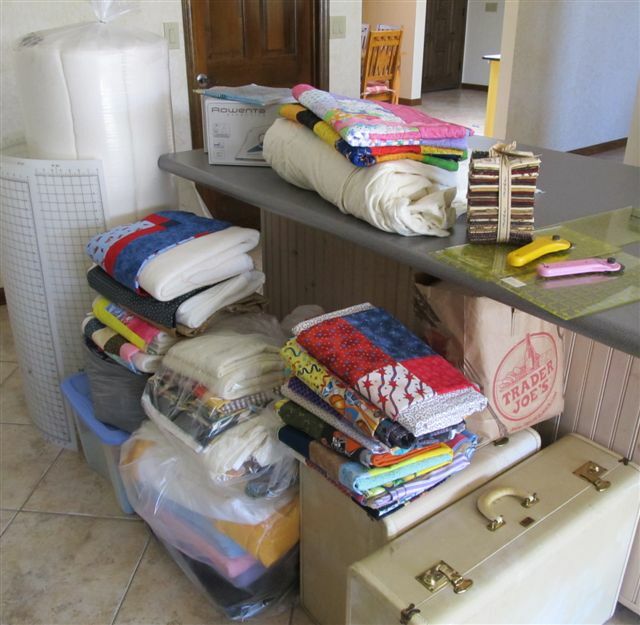 Since I’ve known Cathy her mission has been to make a dent in her SCRAP collection. 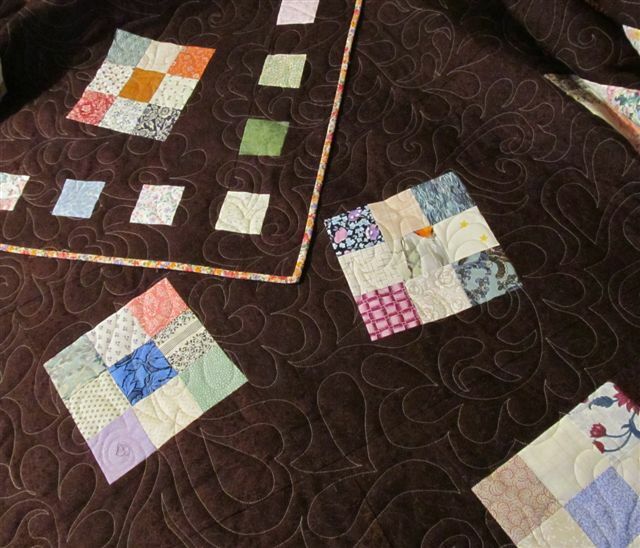 She does such a GREAT job of using scraps I thought I’d share with you a few of the quilts in her finished pile. 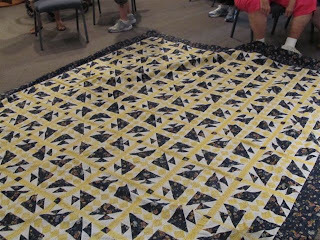 I also snapped a picture of one special quilt that helped create that scrap collection. 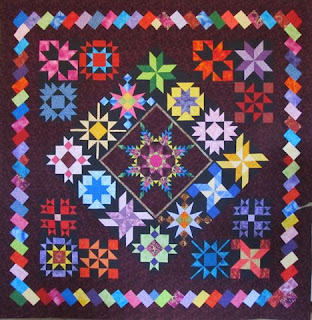 Most of Cathy’s quilts are hand quilted but this one was quilted by one of Cathy’s helpers, a professional longarm quilter named Monica Croom. 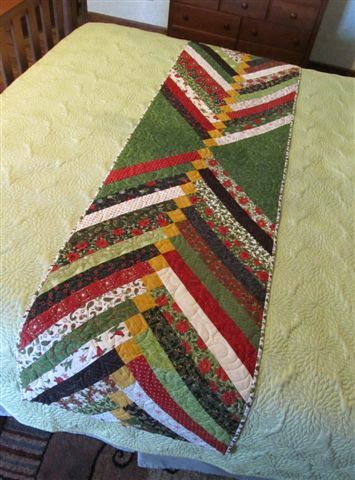 are one inch finished and pretty much perfectly pieced. This one hasn’t yet been quilted but still inspired me. These stars were 12 - 16 inches (I don’t know exactly) and there was six of them. This quilt is entirely done with appliqué. 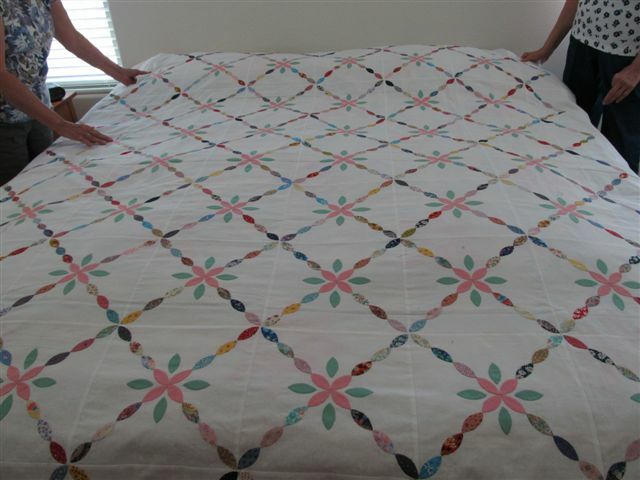 It was not quilted which allowed us a peek at Cathy’s absolutely perfect hand stitches. What a TREAT! 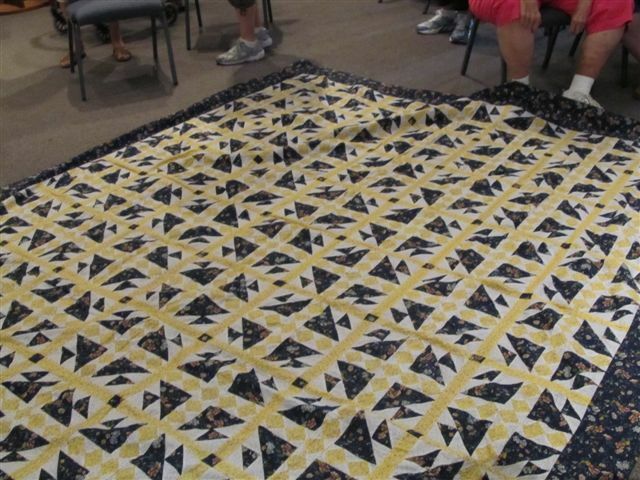 What a simple quilt to piece with Nine Patch and Quarter Square blocks. 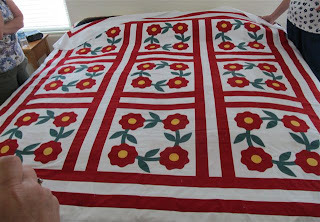 And if that’s not enough to make you say Ohhh then the appliqué border sure will. 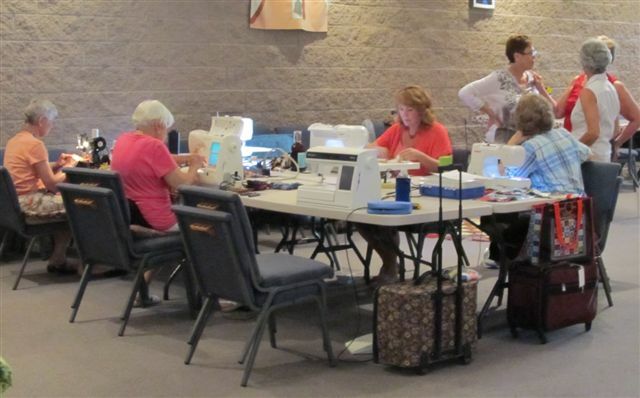 ﻿Don’t you think Cathy has the scrap thing down? That’s a WHOLE LOTTA bow ties! This is a BUNCH of little pieces. I don’t even keep pieces this small cuz I know I don’t have the patience to work with them. 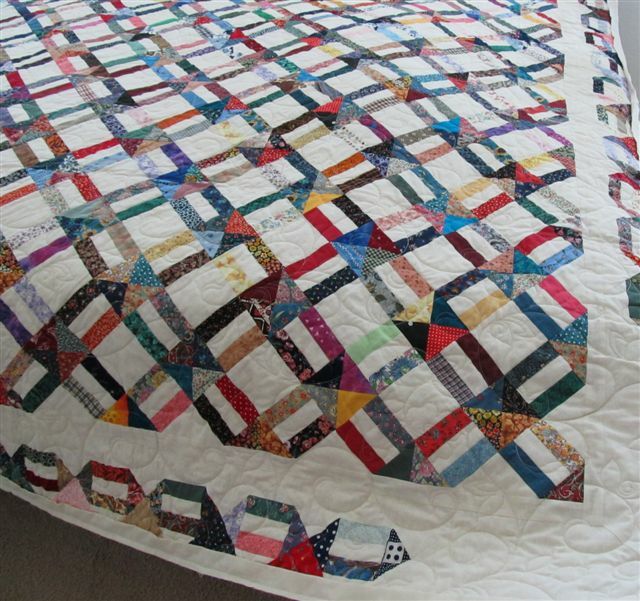 This one was layered but not yet quilted. 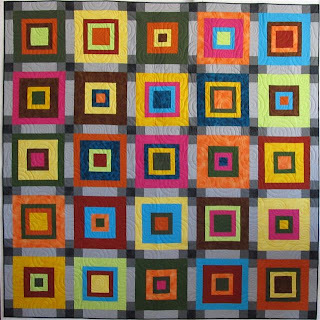 Again… a GREAT use of that easy Nine Patch block. Cathy is in the process of hand quilting this one. I don’t know how anybody has the patience to do that! This little piece was about the size of a place mat. All those black strips were created by a narrow strip of fabric folded in half lengthwise and sewn in the seam. They are three dimensional! And here’s the CROWN JEWEL of the BED TURNING! 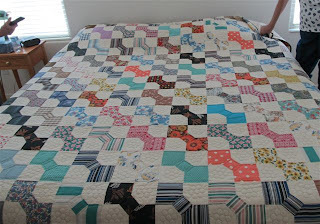 It’s not yet quilted but ya know she’ll hand quilt it. These are a small sample of the quilts Cathy had piled on her bed. Are you inspired? This project has been sitting untouched for about 3 months. 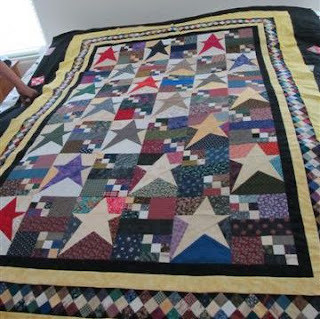 I made one of these 4 months ago for a charity group www.peacebypiecequilters.org that I sew with every month. This is like a Big Board only a whole lot easier to make a store. 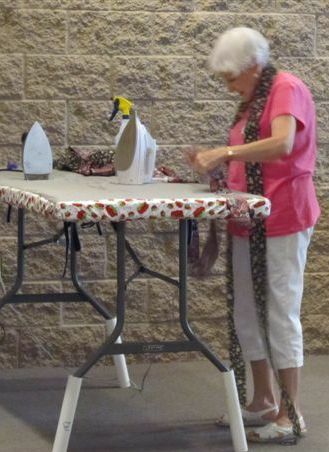 A couple dozen ladies come to every bee so two ironing surfaces are needed AND the facility we sew at does not give us storage for ironing boards. So we needed something that was easy to transport back and forth the bees. It wasn’t in the UFO pile very long. Which makes me wonder… How long do you go without working on a particular project before it is considered an UFO? 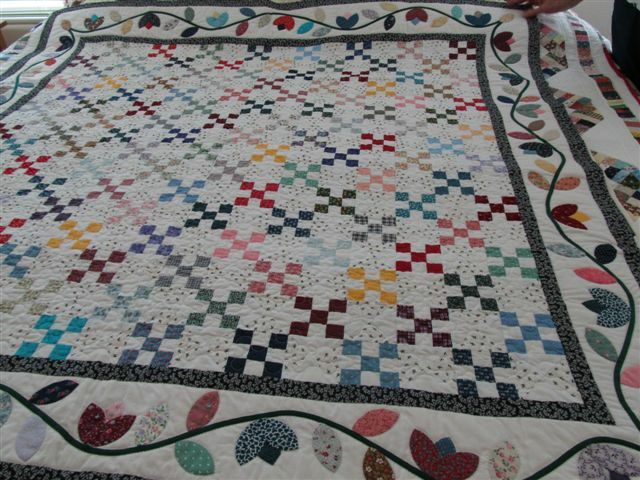 I’ve never heard of a time rule being in the Quilt Police Rule Book! 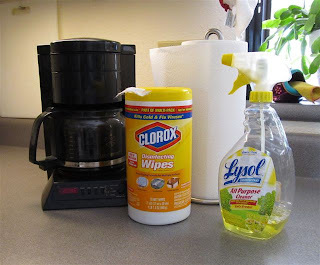 If you have stumbled on this blog post and think your charity group (or yourself!) would Like to make one drop me a note and I'll share with you how I did it. This is the next project I am hoping to get outta the UFO pile. 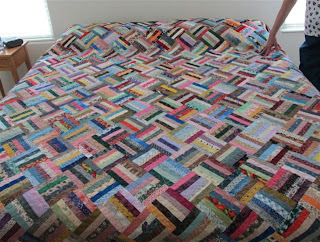 It just needs quilted and bound. As soon as it was unfolded I realized WHY it was in that UFO pile. That slight “S” curve that is very evident down the center is NOT part of the design. The whole piece is CURVED like an “S”! 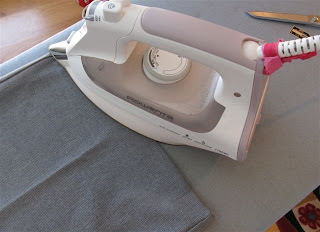 I gave it a good dose of Fresh Press and laid a hot iron on it while stretching the edge that curves to the inside and it didn’t HELP A BIT! Short of taking it apart and giving it another round on the sewing machine, I’m at a loss on how to FIX THIS. Any suggestions on how I can fix this (preferably WITHOUT taking it apart) AND how to avoid this effect in the future? Everyday when I enter my closet the same thought crosses my mind, “Man, there’s a LOT of STUFF in here.” Yesterday was no exception. Sometimes I’ll pick one (maybe two) things and throw it in the box for Goodwill. I figure if I remove something (permanently) once in awhile then MAYBE it will gradually come down to a more acceptable level of STUFF. 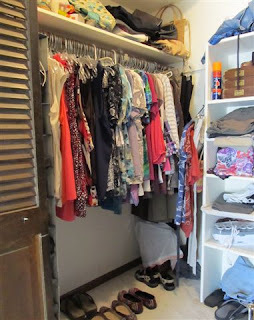 I’ve tried the traditional, cleaning the closet method where ya just go in there with some boxes and remove everything that I no longer wear and it doesn’t work for me. 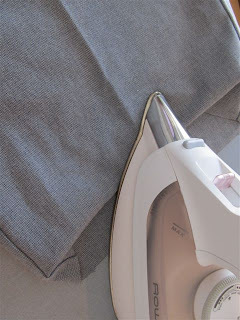 Brain takes over and tells me “You might need that for something.” So yesterday I removed a pair of Capri pants that I haven’t worn in a couple of years. As I’m walking across the hall with them I’m thinking, “These were really comfortable pants.” You see, Brain does this to me every time; it tries to talk me out of getting rid of something. Sometimes Brain wins and sometimes I win. The conversation continued something like this… “The only reason I stopped wearing these is because of the cuff.” And then Brain said, “Well maybe you should just get rid of the cuff instead of the WHOLE pair of pants.” “Hmmm” I said. “You’re right! I could turn them into a pair of shorts which I would probably wear often cuz I don’t have a pair of grey shorts!” So a new project was born! So much for my mission to work UFO’s. Here’s the carpi’s, 26 inches long. As you can see Brain got them from the closet to the sewing room pretty quick! To figure out how to take these from capri’s to shorts I measured the length of a pair of shorts I like and wear often to give me a short length I'm comfortable with. 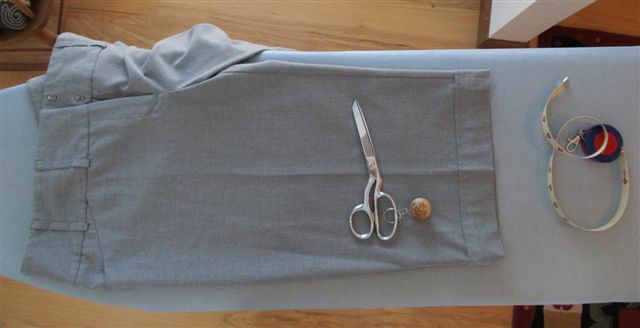 The capri’s were long enough that I could just cut off the cuff and have enough fabric left to give me the length I wanted with a nice size hem. Much easier than having to remove the original stitching! 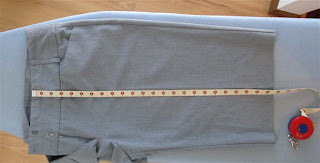 So I just laid a tape measure down the front of the capri's and marked the desired finished length, which was 22 inches. 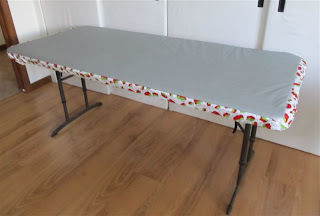 I folded the fabric under (wrong sides together) at the 22 inch mark. And simply pressed the fold to give me a visual line to start with. Then I folded the entire bottom edge to the inside, making sure it was straight and level across and pressed across the whole bottom edge. This not only helps hold the fabric in place but the crease also gives you a visual mark to fold and pin. Then I folded the top raw edge down (wrong sides together) about a quarter inch making sure the top edge of the fold was 1 ¼ inches from the bottom fold. 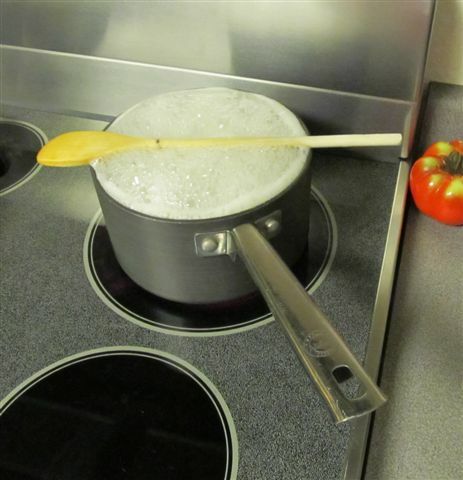 Pins were used to hold it in place. 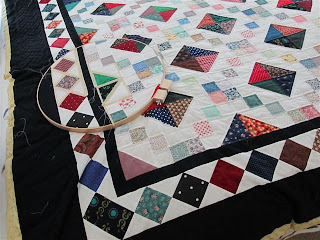 I then stitched along the top edge of the fold with a matching thread. And here they are finished! This whole job took less than an hour. I could have done the sewing by hand which would have given a more tailored look, but I’m a casual kinda gal so the machine stitched hem works for me. UFO Now in the DONE Pile! 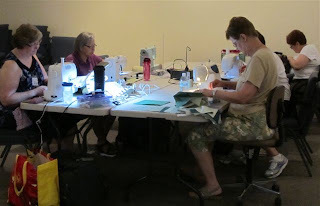 It started as a friendship project between members of the Cactus Patchers, www.cactuspatchers.com. The project began prior to 2003. 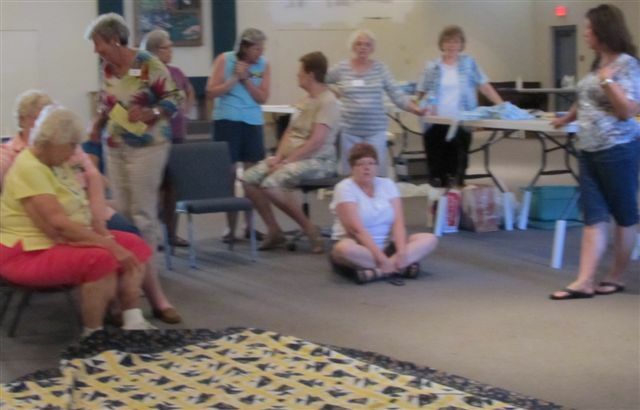 I know it began prior to 2003 because that’s when I joined the group and the project was part of history and the person who owned these blocks, Jean Lackey, was no longer a member of the group. This is how the friendship project worked. 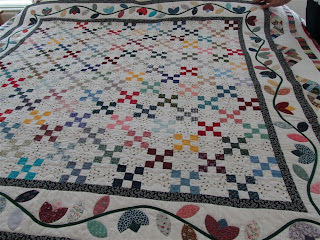 Each participant would make six inch scrappy nine patch blocks using their own stash. 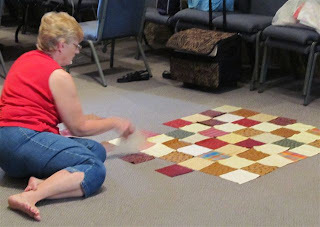 She would then trade her blocks with the other participants. Each person would go home with the same number of blocks they made. In 2006 Jean came to the Cactus Patchers with news that she was having a sale to GET RID OF all her quilting STUFF. (I really don’t understand how a person walks away from this craft, but anyway.) At that sale I acquired her collection of nine patch blocks. Now, I’m really NOT a nine patch kinda gal. I do admire them but am not interested in making them. 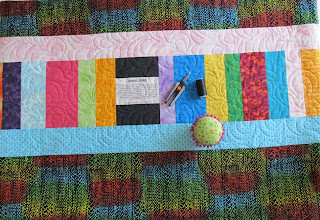 So I gave these blocks my own TWIST by using them to create a wonky twelve inch block. 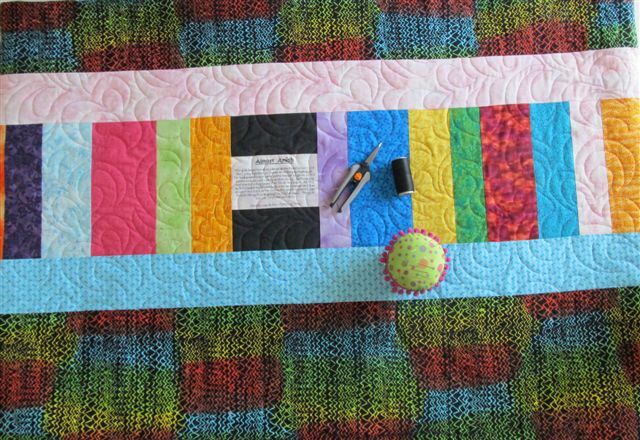 I don’t recall how many of these blocks were in Jean’s collection but there were not enough to make a quilt as BIG as I wanted so I made a few extra blocks (the finished quilt has a total of 72 blocks). A border was also added to finish it off. By the time I got done ADDING the top was 105 x 114”. Plenty BIG enough to nicely cover my king size plush pillow top bed. 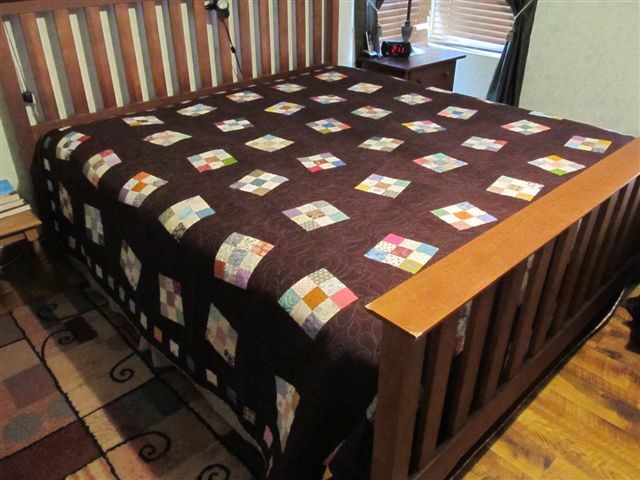 BUT since the quilt top was completed I have changed beds and no longer have that plush pillow top. 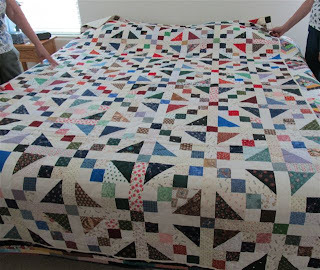 So the FINISHED quilt almost touches the floor on ALL three sides! 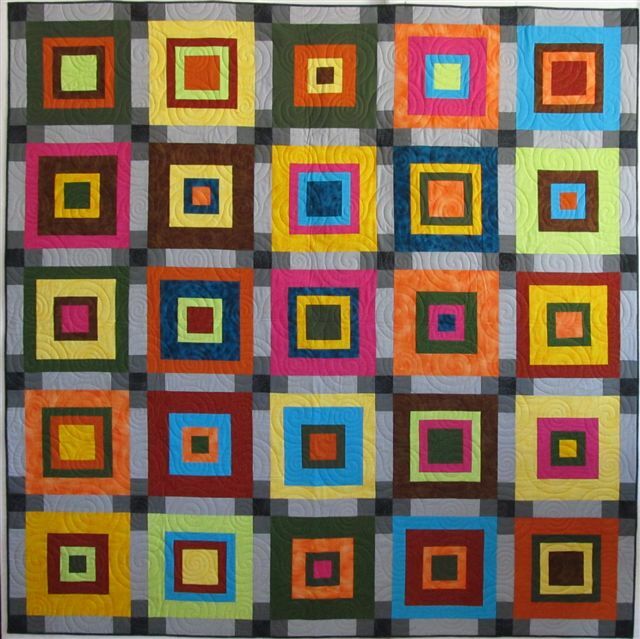 Cuz I’m a Quilt Police abiding quilter (sometimes) I did make a label. I didn’t get fancy cuz my REAL goal was to be done with the project! It was created in a word doc with a picture of three nine patch blocks imported and verbiage that shares the quilts story, then printed on fabric. And it’s DONE! ~ Some say the myth began to surface at least 1780 B.C. ~ The phrase Friday the 13th was not mentioned in American literature until 1907 but is frequently seen thereafter. ~ This date falls one to three times per year. There will be three occurrences in 2012, exactly 13 weeks apart. ~ Paraskevidekatriaphobic is the Psychiatric title given to people who suffer from the disorder of a 'morbid, irrational fear of Friday the 13th'. ~ Some sources say it is the most widespread superstition in the United States. The number of Americans suffering from this condition may be as high as 21 million, that’s eight percent. ~ Some people refuse to go to work on Friday the 13th; some won’t eat in restaurants; many wouldn’t think of setting a wedding on the date. ~ On Friday the 13th many people around the world avoid travel and surgery. ~ Many cities do not have a 13th Street or a 13th Avenue. ~ Many buildings do not have a 13th floor. ~ If thirteen people are seated at a table one of the thirteen will die within a year. ~ Never change your bed on Friday; it will bring bad dreams. ~ According to biblical sources, Friday was the day on which Eve offered Adam the forbidden fruit and Jesus was crucified. ~ The Turks so dislike the number 13 that it almost doesn’t exist in their vocabulary. ~ On the streets in Florence, Italy, the houses between number 12 and 14 is addressed as 12 and a half. ~ A 2008 Dutch study found there were fewer automobile accidents, fires and crimes occurring on Friday the 13th, adding the caveat that superstitious would-be victim may simply have stayed out of harm's way. 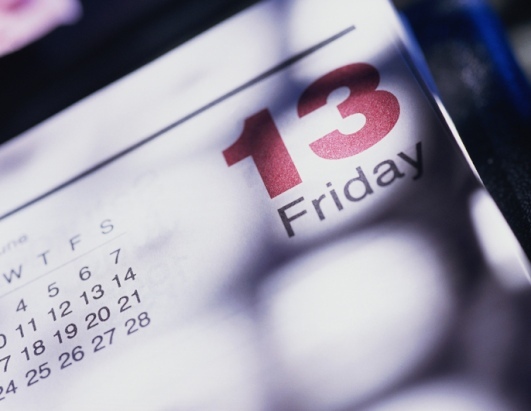 ~ A study in the United Kingdom found that while consistently fewer people chose to drive their cars on Friday the 13th, the number of hospital admissions due to vehicular accidents was significantly higher than "normal" Fridays. ~ One hundred years ago, the British government sought to quell the longstanding superstition among seamen that setting sail on Fridays was unlucky. A special ship was commissioned and given the name "H.M.S. Friday." They laid her keel on a Friday, launched her on a Friday, selected her crew on a Friday, and hired a man named Jim Friday to be her captain. To top it off, H.M.S. Friday embarked on her maiden voyage on a Friday — and was never seen or heard from again. ~ Ancient Chinese regarded the number 13 as lucky, as did Egyptians in the time of pharaohs. ~ To the ancient Egyptians life was a quest for spiritual ascension which unfolded in stages - twelve in this life and a thirteenth beyond, thought to be eternal life. ~ In many Spanish-speaking countries, instead Friday, Tuesday the 13th is considered a day of bad luck. ~ In Italian popular culture, Friday the 17th (and not the 13th) is considered a day of bad luck. One Good thing I found mentioned on several sites is that a baker’s dozen is a good thing! I Seam To Be On A Roll ! Seems like I'm on a roll with getting UFO's out of the closet and moving towards the DONE pile... Well, roll may be a bit presumptuous. Roll sounds like I'm really going for it and gaining speed, when in fact I may run out of momentum at any moment. 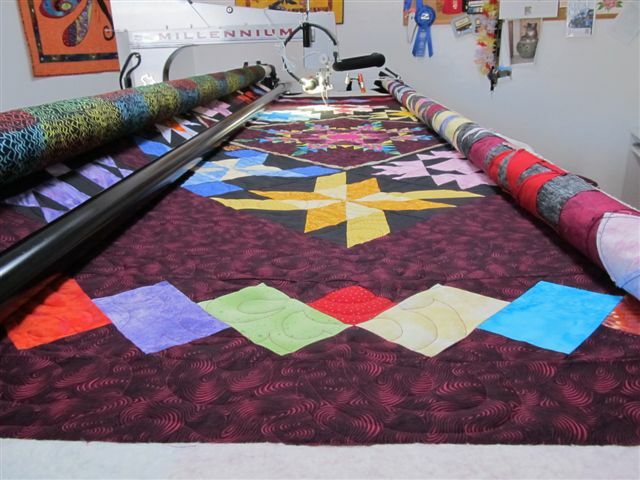 A couple of days ago I shared a UFO from 2006 that was on the longarm (FINALLY) getting quilted. Well now I'm down to doing the hand work on the binding. 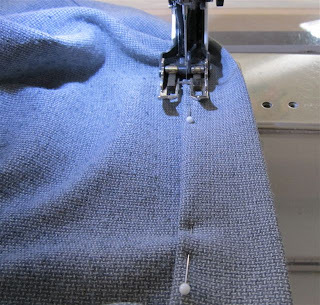 Since hand work is an evening TV watching activity I decided to work on something else that requires a machine. So in the closet I went again and dug out another UFO from 2006. 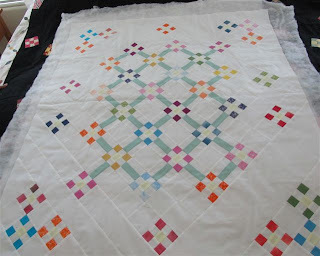 ﻿﻿﻿﻿﻿ This one, like the last one, is a top that needs a back pieced. The top is a sampler (of sorts) with blocks that have a black background. 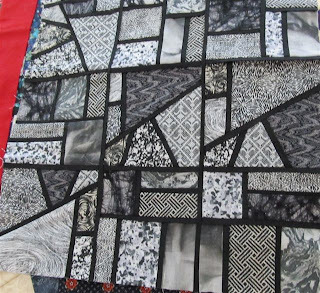 The block design was made using a multitude of scraps. 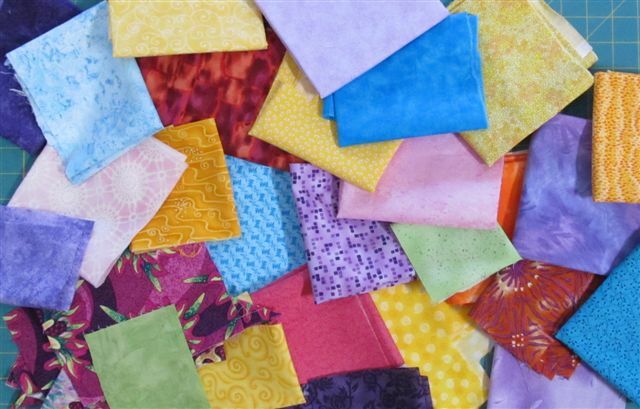 Not really wanting to go fabric shopping (Yes, you read that statement correctly) I made a visit to the STASH. I did come out with a hunk of fabric that will serve well as a back on this quilt BUT there was NOT ENOUGH. Which means I gunna have to do some real piecing! 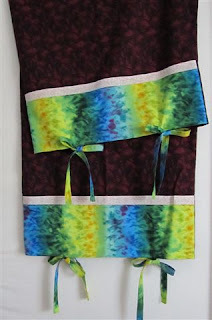 ﻿﻿ I went through the scrap bucket and came up with some of the same fabrics used on the front plus a few extras. 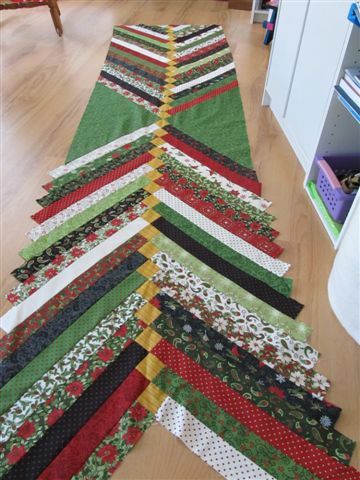 Since a whole section was going to have to be pieced into the back using all these SCRAPS I may as well make it look PLANNED. 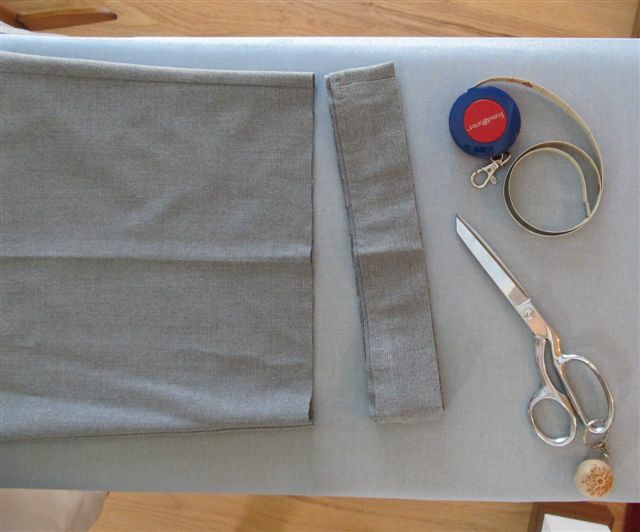 And sewing the label into this section will accomplish that. ﻿﻿﻿﻿﻿ My label making method is to compose the verbiage in a word document and print it out on fabric. But my printer wasn't on board with that plan. The printer and I went 5 rounds with the printer CHOKING ON ALL 5 of them so I gave up and began to write it out by hand (something I haven't done in years). Even this method was a trying one. 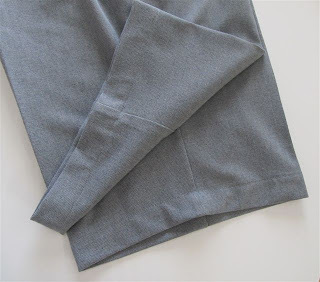 With a few words on the fabric my Pigma pen started to run out of ink! REALLY! But I persisted and kept going over the letters to darken them until there wasn't another drop of ink left, but a whole lotta words were still left. So I drug myself out into the Heat Advisory temps and made my way to the closest JoAnn's. Back home with my new pen I finished the label but the end result was pretty UGLY. That section that I kept going over with the running out of ink pen, it was BLURRY! 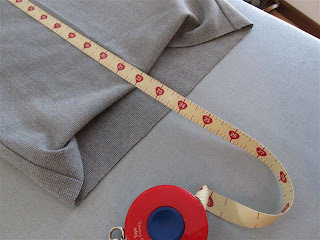 I started over with a new piece of fabric and my new pen. So my section that looks PLANNED with a label sewn in... took a total of 7 labels before the mission was complete!!! 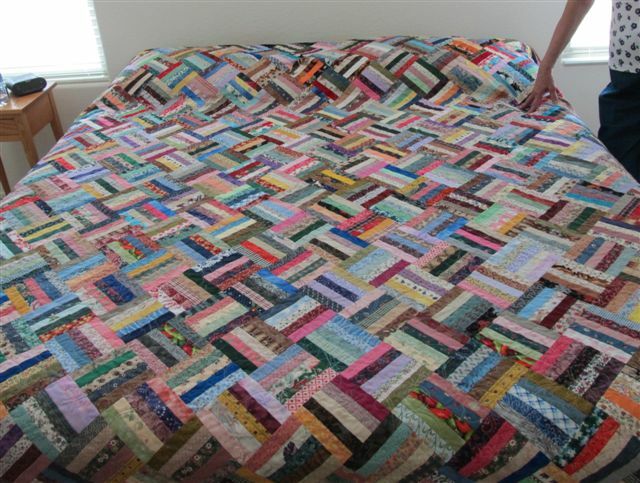 That right there is dedication to the quilt police rule that says, "LABEL YOUR QUILTS"! 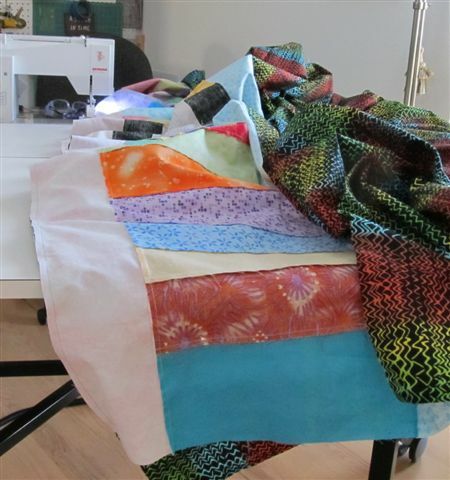 YES, another 2006 UFO is on the longarm and getting closer to the FINISHED PILE. 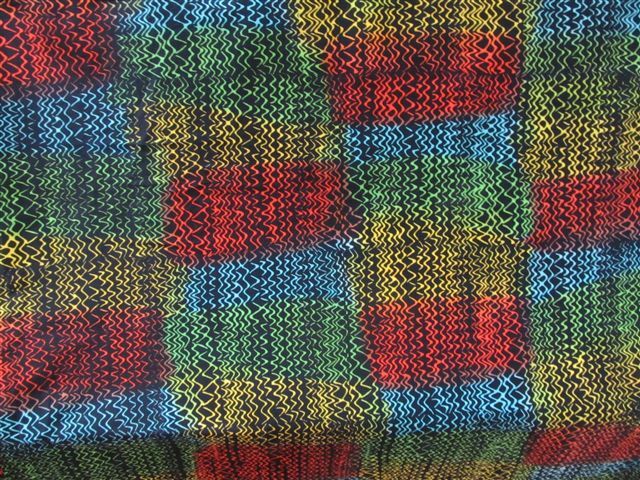 Hopefully the stash closet has something I can use for a binding.